Philanthropist Mary Reynolds Babcock founded Old Town Club in 1939 following a substantial $30 million inheritance from her father, R.J. Reynolds, founder of R. J. Reynolds Tobacco Company. Mary became one of the richest women in the world but her primary interest was in helping others and the Mary Reynolds Babcock Foundation still bears testament to her altruism. Perry Maxwell was the architect chosen to fashion Old Town Club and the golf course was ready for play in November 1939. The course was immediately heralded as one of the top ten courses in the USA. Perhaps the most notable features at Old Town are the green complexes which are severely canted and notoriously tricky. These greens need to be studied and understood in order to avoid the dreaded three putts or worse. Old Town measures around 7,000 yards from the tips and the key to scoring well is via accurate approach play. If you find yourself on the wrong part of the green or facing a chip from just off the green you can generally expect to drop at least one shot. The course itself is routed across rather hilly terrain so many awkward stances add up to a fascinating Old Town golfing challenge. A tiny membership negates the need for tee times which makes Old Town feel like an “old school” golf club. But it has one eye on the future and is home to the Wake Forest University golf team. If you are only slightly interested in golf course architecture, you should study Old Town’s greens for a moment and wallow in the nostalgia of a bygone era. 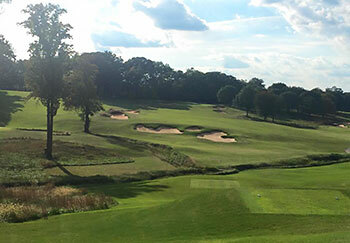 Restoration work by Coore & Crenshaw commenced in 2013 and in 2016 work was still in progress with the duo returning to add new bunkers and to supervise the removal of yet more trees. Perry Maxwell built Old Town just before WWII at the tail end of the Golden Age of Architecture. The property is fairly hilly yet, like many classic courses, one never gets the impression that the walk is severe. With one exception, tees are located close to greens. Maxwell took advantage of the hills to create a brilliant set of undulating greens with steep swales and strong contours. It would be a mistake, however, to think the greens are the sole interest of the course. The slopes and up and down nature of the fairways place a strict demand controlling ball flight especially when the course is keen. Many of the approaches are uphill or have slightly raised greens which may encourage the player to carry the greens and risk what is often a dire position in being long. The feeling of being on a course of grand scale is further enhanced by the recent (and continuing) felling of many trees which afford lovely interior views. If you plan to be anywhere near Winston-Salem it is worth a bit of grovelling to play Old Town. Even Tom Doak thought so. Old Town Club has my vote for one of the most underrated courses in the world at the present moment. This last summer, while spending some time in Pinehurst, I had the wonderful opportunity to enjoy a second visit to see this recently renovated Maxwell gem. Coore & Crenshaw have indeed pulled off one of the best renovations ever and one that should be used as an example for all students of architecture. In my estimate the only thing keeping this course out of its well-deserved place among the magazine World Top 100 golf courses is time. Make no mistake it’s a Top 100 Golf Course and one of the best members clubs in existence on top of that. It’s a great routing with wonderful green complexes and perfect land for golf that has been masterfully optimized to bring out all the features and on top of that wonderful natural bunkering. What more could you want? If you have the chance to visit OTC jump on a plane and make it a priority. You won’t regret it. I’d heard all about Perry Maxwell’s “rolls”, but had never seen any until I arrived at Old Town. They might better be called hillocks as most are little humps providing a putting challenge unlike any I’d experienced before. There’s plenty of challenge from tee to green as well. But don’t be cowed by Dunlop White’s pointing out that there are now three times as much bunkering as before. Most are in places the golfer can avoid. The “alligator eyes” bunkers that Dave Axland built at # 14 are a perfect example. Moreover, the doubling of mown fairway also contributes to the course's playability. And only at #s 2, 4, 8, 16 and 17 is an aerial shot required to find the green. Along with Cypress and Merion, Old Town has the distinction of being the only U.S. course I could find on this site with unanimous six ball ratings. It was not a difficult decision for me to add that same rating to that group. A genuine test of golf. Old Town will make you use just about every club in your bag. I’m a member and have the luxury of playing there often. Although situated in Winston-Salem, you get the feeling you’re in the mountain foothills. The course was designed by Perry Maxwell around 1939 and was recently updated by Coore & Crenshaw in 2013. Kudos to Dunlop White III for contributing significant support, blood, and sweat to the newly renovated grounds. Perry Maxwell is known for building golf courses with progressive par 3’s that increase in length the further you advance. At Old Town, the first par 3 hole #2 measures 166 yards, while holes #6, #11, and #15 measure 186, 216, and 245 yards respectively. My favorite holes are #3, a challenging up-hill 427 yard par 4 that requires 2 superb shots to hit the green in regulation; #7 a 419 yard par 4 starting from an elevated tee box that requires you to carry a series of horizontally positioned fairway bunkers and hit a tiny multi-tied green from an uneven fairway lie; and #14, a short 335 yard par 4 that’s guarded by a left water hazard, trees on the right, and an elevated green surrounded by bunkers with a severe left side drop off reminding you of something you’d encounter on Pinehurst #2. As I travel a fair bit and have the opportunity to see several different golf courses, my avid play allows me to truly appreciate the uniqueness of Old Town. Many, by today’s standards, would consider Old Town too short measuring just 6,800 yards, but it plays 300 – 400 yards longer. There’s very few level lies on the golf course. That, accompanied by very demanding tee shots, makes Old Town a real player’s golf course. The more I travel, and the more courses I play, the more I truly understand the greatness of Old Town Club. The restoration work undertaken by Coore & Crenshaw has truly restored this golden age masterpiece back to its full glory. The routing is the heart of this wonderful course. The use of the rolling topography is nothing short of genius. In addition to resulting in a tremendous course and unbelievable green sites, the routing also gives the player several excellent mini loop options (1 - 3; 10, 11 18; 4 - 9). The removal of many trees (no doubt planted by well-meaning committees in the 60's, 70's and 80's) has brought back wide playing corridors and angles of play. Old Town does what is so difficult: to be challenging for the scratch player, but very playable for a high handicapper. In fact, I would argue that the better player, the tougher Old Town plays. This collection of 18 greens surely must be among the strongest 18 greens anywhere. All feature the famous "Maxwell rolls," and they vary in size (10 is very small; the double green of 8/17 is enormous). Coupled with the superior routing, the greens make Old Town one of the best golf experiences in the entire United States. If you get the chance to play Old Town, but all means, do whatever it takes to get there! Coore & Crenshaw returned for additional improvements in 2016. 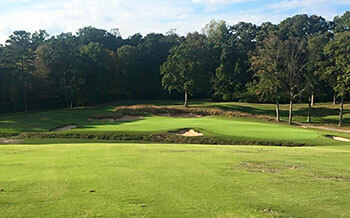 In the last 10 months, long-time shaper Dave Axland added four new bunkers to holes 7 and 8. The restored bunkers today encompass over 110,000 square feet of local riverbed sand, while the pre-2013 versions only comprised 32,000 square feet of the bright-white stuff. Therefore, the restored bunkers are more than 3x larger. This also translates to more than 9x the “linear footage” of bunker edges than before. Throw in a tight mowing pattern (versus a ribbon of rough) to welcome golf balls. Today, the inside leading edges of all bunkers are maintained as fairways. Better yet, many bunkers are maintained with closely-cropped edges 360 degrees around its entire perimeter. The tight mowing pattern lures golf balls like a magnet, and as a result, these bunkers play exponentially larger than ever before. At Coore's direction, we have also expanded our fairways from 35 to 75-acres -- and counting. Thus far, we have converted about 40-acres of maintained bermuda rough to fairway. Today, in more old-school tradition, one single swath of fairway connects holes 4, 7, 17, 8, 9 and 18 successively without interruption of maintained bermuda rough. Harks back to the days of gang mowers and eliminates a multitude of busy modern rough lines. Plus, closely-cropped turf better exposes our rumpled terrain. Every natural depression and bump -- all the imperfections in the ground -- are now exposed with shadowing that would otherwise would be lost to the eye in the rough. Plus, Old Town just removed an additional 200+ trees "in-house" opening up vistas in the heart of the golf course in excess of a mile from east to west -- and just shy of a mile from North to South. Looking lore and more like a raw, early-American landscape. I have to hand it Dunlop White III. After seeing what his enduring labor of love managed to produce with Roaring Gap’s wonderful renovation I was thrilled to be headed that same afternoon to Old Town Club. Want to make a huge impact on the world of golf, take a place that’s desperately in need of some serious renovation love, find an extremely passionate and knowledgeable golf course enthusiast like Dunlop and finally have the means to bring in the dynamic duo of Coore & Crenshaw on a wonderful property with the bones of Perry Maxwell. Talk about a formula for success and a poster-child for the golf industry of how to hit a homerun! The least you can say about Old Town Club is wow! Simply amazing place! C&C have restored so much width enabling maximum benefit of solid strategy, all depending on the days pin positions. I’d venture to say this width is a key feature that 95% of all golf courses neglect in an effort to do make their courses championship ready or challenging for top players, most of which don’t make up their memberships. Old Town of course benefits from a fabulous and varied site, from fantastic green complexes and surrounds and finally the bones of a wonderful routing and usage of the property from Maxwell. It certainly deserves to have every hole described and regarded as excellent, however I will try my best to only select a couple to highlight. The second hole is a medium length par 3, playing across a bit of a depression into a beautiful green with wonderful bunkering. Deceptively this hole played much shorter than the distance suggested leaving a challenging up and down from up on the hill behind the green. The par 4, 5th is an excellent dogleg left that simply begs you to try and cut the corner and carry the bunkers in an attempt to avoid being blocked out from the green by the couple large trees inside the dogleg. The green is set up on the hill and requires an exacting approach. Appropriately this is one of the more difficult holes on the property requiring two excellent shots to make the green in two. The wonderful short par 4, 14th is my favorite hole on the property. Certainly drivable under the right conditions for the extremely daring but in truth there may not be an easy sure way to guarantee success on this hole. Yet, you could just as well birdie it with a 5 iron and a great wedge approach. The green pushes the boundary of social acceptability and I imagine it delivers its share of complete surrenders yet that’s the beauty of the design in this case. Take a short little hole that people may even laugh at from the tee and fill it with so much strategy that whatever decision you take to play it you will be challenged to execute it well. The green slopes severely from right to left and falls away on the left side. That may be the one feature that makes this hole controversial for some who may putt or chip the ball past the pin and have it roll off the green into serious trouble. Still it remains my favorite hole on a property full of wonderful holes. The last hole I would like to highlight in my review is the par 5, 17th. Standing up on the hill looking out at one of the widest most inviting landing areas ever all lights read go for it. Your playing partners challenge you to hit into the fairway bunkers at about 300 yds out into the wind knowing very well, you CAN’T reach them. A true go for broke shot. With a very long drive you have a shot to go for the green in two, the green one of the largest double greens you’ve seen is reachable with a blind shot over a hill and has a stream running diagonal across the line of play from right to left. Talk about risk reward shots. The other option that most will take is to lay up on the second shot which requires a blind shot up over the hill and leaves a mid to short iron approach from up on the hills down over the stream to this large green. A simply wonderful and fun par 5. It’s easy to understand how enthusiastic I am about this course. It certainly belongs in the World Top 100 and will take it’s place among the world’s best sooner rather than later. Dunlop White III, I salute your hard work, heart and soul for this wonderful game! Thank you ! Here’s to a world full of more wonderful, passionate, enthusiastic and knowledgeable caretakers of GCA. This is the most underrated golf course in the United States. Talk about flying under the radar. This Perry Maxwell design from 1939 was recently renovated by Coore/Crenshaw. Bill Coore has a personal connection to Old Town, which borders Wake Forrest University. Some years ago, he mentioned to the club that if ever an opportunity arose to restore the golf course, he wanted to have a lead role. The results are truly breath-taking. It’s the best piece of land for a golf course I’ve seen in this country. The routing across the changes in elevation is, in my opinion, Maxwell’s best course on earth. Watch out for this on every World 100 list going forward.